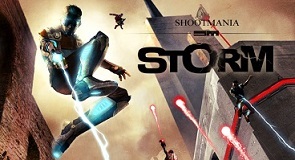 Shootmania Storm is a first person shooter game by Nadeo, makers of the Trackmania series. Like Trackmania, Shootmania comes with a full featured editor and a set of example maps, it is left to the community to produce the majority of the content for the games. As a result, there are many skins and mods available, as well as thousands of quality player created maps. The game plays a bit like an "old school" fps, there is no grinding or leveling up, all players have the same set of tools and weapons leaving the outcome of each match up to actual player skill. Perhaps the biggest caveat that sets the game apart from the pack of pc fps games is that it is not rife with cheaters, and in fact seems to have no real cheating happening on any noticeable level. On the negative side the game does sometimes suffer from a low player population, but this can be circumvented by playing with pals as seen in the video below. When we start a game people do tend to join us, and the game is quite a bit more popular in Europe where it is played on a competitive/esport level. A free demo of Shootmania Storm can be downloaded here, and the full version can be purchased for around $20 at that same site.